अलादीन in movie is better looking या in series? Production begins in India this महीना on the अलादीन 3477 movie, before moving on to numerous exotic locales throughout Southern Asia. Loosely adapted from the classic Arabian Nights tale, अलादीन and His Wonderful Lamp, this live-action version is set 1,500 years into the future. The movie is directed द्वारा तारा, स्टार Wars artist Matt Busch and is produced द्वारा Kaleidoscope Koi Entertainment, LLC. Before my favourite अलादीन film, The Return of Jafar came out in 1994, This classic first अलादीन film came out in 1992. This is a story of when अलादीन first met Jasmine, The Genie and One of my favourite डिज़्नी villains of all time, Jafar. Jafar, Grand Vizier to the Sultan of Agrabah, is attempting to retrieve a magical oil lamp containing a genie from the Cave of Wonders. After seeing a petty thief's failed attempt to enter the cave, Jafar and his parrot, Iago, learn that only a "Diamond in the Rough" can enter the cave. ARTIST MATT BUSCH TO DIRECT LIVE-ACTION SCI-FI अलादीन MOVIE! DETROIT, MI -- On his 40th birthday, Artist/Director Matt Busch announced candidly on his YouTube channel he will be लेखन and directing a feature-length live-action movie titled अलादीन 3477. Loosely adapted from the Arabian Nights classic tale, अलादीन and His Wonderful Lamp, this version is set 1,500 years into the future. The movie will be produced द्वारा Kaleidoscope Koi Entertainment and filming in locations around the world. I fell in प्यार last night. a comment was made to the poll: Which girl (besides Jasmine) सूट्स अलादीन best? a comment was made to the poll: Do आप prefer Jafar या Aladdin? 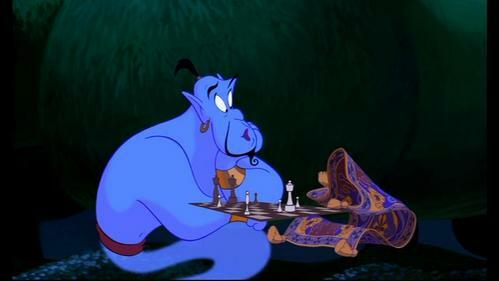 Who does the Genie impersonate when he says "I can't believe it. I'm losing to a rug"? हे अलादीन Fans! Come check this out!